The Ohio Department of Health (ODH), Bureau of Environmental Health, Indoor Environments Section houses the School Environmental Health Program. This program works to improve the environmental health of Ohio’s schools through both regulatory and non-regulatory means. 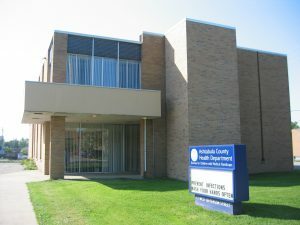 The Ashtabula County Health Department inspects approximately 30 schools on an annual basis. During these inspections, Registered Sanitarians identify health and safety conditions and sanitation practices within the school environment that may pose a threat to students and staff. Items which are focal points during a typical inspection of the school environment include indoor air quality, proper storage and handling of hazardous chemicals, pest control and pesticide use, playground safety, communicable disease prevention and practices, proper food handling in kitchens and cafeterias, and general fire and electrical safety. Sanitarians also work closely with school administrators and school nurses and make them aware of public health concerns identified in a school building. School kitchens are licensed and inspected in the Food Service Program. (440) 576 – 6010 option 5.